The story begins with Bill who is seeking refuge in his house following an outbreak of a deadly virus. 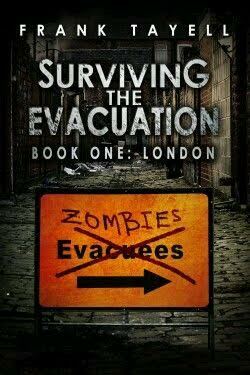 As the undead begin to take over the city, London has had to be evacuated. Bill remains at home with a broken leg which ultimately renders him useless. His childhood friend Jennifer has assured him that one of her government associates will in time come and rescue Bill. In the meantime he has a limited amount of food and water to keep him going. He must be careful though to ration the food as it won’t last forever and he doesn’t know when he will be rescued. This book is written in journal format and is Bill’s day to day account of how to he is surviving in a world that has been taken over by the undead. It starts out as 21 days since the outbreak began, 18 days since Bill returned from hospital and 7 days since the inland areas of Britain were evacuated. Surviving The Evacuation has two parts. In Part 1, we learn what Bill must do to ensure his survival and we also get a good sense of the emotional rollercoaster he has been swept into. One minute he is feeling hopeful and the next he is melancholic and devoid of any hope about his situation. In Part 2, we see the pace pick up and with that we see a change in Bill’s outlook and overall attitude. As the story unfolds, Bill is faced with many dilemma’s in relation to whether he should stay in the house or go out into the world and face his biggest fear. His food and water is not going to last forever and sooner or later Bill has to face the reality of his situation. We see him really struggle with making a decision here. But with a broken leg, is leaving the house even an option for Bill? Also, there is a chance that his friend Jen has one of her colleagues coming to rescue Bill. With cabin fever setting in and panic coming to the surface, it becomes clear that Bill has some very important decisions to make and time is not on his side. I was in search of a Zombie book to fill the massive “Walking Dead” shaped hole in my heart. I heard of the “Surviving The Evacuation” series on my facebook book group. One of the members was gushing about it and I just knew I had to give it a try. I wasn’t disappointed. I found this book really easy to engage with and loved the fact that it was written in journal entry format. The writing style was accessible and highly readable. The main character Bill was not the “hero type” that I was expecting. He was flawed, wonderfully and undoubtedly, flawed. My favourite type of character. Anyone who reads my reviews knows that I do not seek perfection in my characters. The more flawed and troubled they are, the more I can relate to them. Bill is not particularly proficient or skilled, he is self-absorbed and he is the master of procrastination. Needless to say, these attributes are not very condusive to surviving an apocalypse. Ultimately, he does little to inspire the reader of the likelihood of his survival. That said, Bill does evolve as the story progresses. While many of his plans end up getting sabotaged, he does however find some creative ways of turning the situation around. What I like about this book is that we are getting the story from a personal point of view. I got a real sense of the level of panic one would feel, being in Bill’s predicament. His injury, combined with the fact that his supplies are running low, leaves the reader in no doubt as to the plight of his situation. I found Bill to be very relatable and could see myself going through the same thought processes if I were in his shoes. His situation is bleak and Bill is all too aware of this. That is what makes the book such an interesting read. You really don’t think Bill stands a chance. What I didn’t like about this book was the tension. I felt that it fell slightly short in this area. I can’t really go too much into this without giving the story away so I will just park it there. When it comes to dystopian and horror type genre’s, tension is what draws me to a story and that is what I need. Also, the pace could have been picked up a notch in my opinion. Overall though, I found this book highly readable and I enjoyed being in Bill’s head for the duration of this book. The protagonist was multi dimensional and he really came into his own by then end. I didn’t have too many un-answered questions and was happy with the wrap- up. Even though it is part of a series, in my opinion it could work as a stand alone. A good read, not brilliant but good. I am definitely going to continue with the series. I would recommend “Surviving The Evacuation” to anyone who enjoys The Walking Dead and fans of the Zombie and Dystopia genre. This puts me in mind of Day of the Triffids a little, more so considering the protagonist’s name is “Bill” (as it was in the Wyndham classic). I haven’t heard of Day of the Triffids would you believe, I must look it up. If you like the diary format, I would recommend World War Z, though I suggest the audio book. Many people have commented that the paperback version is “boring” because all of the characters start to sound the same, they say. This is not the case at all in the audio book. Thanks so much for the recommendation. I think the last audio book I listened to was Cinderella when I was a little girl. I love zombie apocalypse novels! Quite frankly, I’m a little obsessed the idea, silently. This book sounds really great! However I don’t know if I’d like the style because with this kind of genre I like the action a lot more. Its so good to know I’m not alone with my zombie obsession. The Walking Dead opened up my eyes to this genres appeal. I completely understand what you are saying about preferring more action. I’m more drawn to the emotions and anguish etc. But in saying that I felt this book could have had more action to build on the tension.